We will never sell or rent your information. Your privacy is important to us. 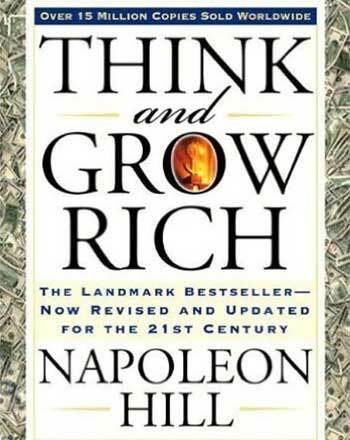 Think and Grow Rich is the 1937 personal development classic from Napoleon Hill that is generally considered as one of the first major law of attraction works and the first that made it into the public consciousness. An original suggestion by Andrew Carnegie, one of the richest men of his time, he wanted to put together a set of principles for success and commissioned Napoleon Hill to make a study of 500 of the world’s most successful and influential people. Hill spent 20 years interviewing these people and boiled down their answers into a set of principles for success that is still held up today as the bible of personal development and success. The book has sold over 75 million copies worldwide and counting and is now in the public domain. When he saw that I had grasped the idea, he asked if I would be willing to spend twenty years or more, preparing myself to take it to the world, to men and women who, without the secret, might go through life as failures. I said I would, and with Mr. Carnegie’s cooperation, I have kept my promise. This book contains the secret, after having been put to a practical test by thousands of people, in almost every walk of life. It was Mr. Carnegie’s idea that the magic formula, which gave him a stupendous fortune, ought to be placed within reach of people who do not have time to investigate how men make money, and it was his hope that I might test and demonstrate the soundness of the formula through the experience of men and women in every calling. He believed the formula should be taught in all public schools and colleges, and expressed the opinion that if it were properly taught it would so revolutionize the entire educational system that the time spent in school could be reduced to less than half. His experience with Charles M. Schwab, and other young men of Mr. Schwab’s type, convinced Mr. Carnegie that much of that which is taught in the schools is of no value whatsoever in connection with the business of earning a living or accumulating riches. He had arrived at this decision, because he had taken into his business one young man after another, many of them with but little schooling, and by coaching them in the use of this formula, developed in them rare leadership. Moreover, his coaching made fortunes for everyone of them who followed his instructions. In the chapter on Faith, you will read the astounding story of the organization of the giant United States Steel Corporation, as it was conceived and carried out by one of the young men through whom Mr. Carnegie proved that his formula will work for all who are ready for it. This single application of the secret, by that young man-Charles M. Schwab-made him a huge fortune in both money and OPPORTUNITY. Roughly speaking, this particular application of the formula was worth six hundred million dollars. These facts and they are facts well known to almost everyone who knew Mr. Carnegie-give you a fair idea of what the reading of this book may bring to you, provided you KNOW WHAT IT IS THAT YOU WANT. Even before it had undergone twenty years of practical testing, the secret was passed on to more than one hundred thousand men and women who have used it for their personal benefit, as Mr. Carnegie planned that they should. Some have made fortunes with it. Others have used it successfully in creating harmony in their homes. A clergyman used it so effectively that it brought him an income of upwards of $75,000.00 a year. Arthur Nash, a Cincinnati tailor, used his near-bankrupt business as a “guinea pig” on which to test the formula. The business came to life and made a fortune for its owners. It is still thriving, although Mr. Nash has gone. The experiment was so unique that newspapers and magazines, gave it more than a million dollars’ worth of laudatory publicity. The secret was passed on to Stuart Austin Wier, of Dallas, Texas. He was ready for it-so ready that he gave up his profession and studied law. Did he succeed? That story is told too. While serving as Advertising Manager of the La-Salle Extension University, when it was little more than a name, I had the privilege of seeing J. G. Chapline, President of the University, use the formula so effectively that he has since made the LaSalle one of the great extension schools of the country. While this book was being written, my own son, who was then finishing the last year of his college work, picked up the manuscript of chapter two, read it, and discovered the secret for himself. He used the information so effectively that he went directly into a responsible position at a beginning salary greater than the average man ever earns. His story has been briefly described in chapter two. When you read it, perhaps you will dismiss any feeling you may have had, at the beginning of the book, that it promised too much. And, too, if you have ever been discouraged, if you have had difficulties to surmount which took the very soul out of you, if you have tried and failed, if you were ever handicapped by illness or physical affliction, this story of my son’s discovery and use of the Carnegie formula may prove to be the oasis in the Desert of Lost Hope, for which you have been searching. This secret was extensively used by President Woodrow Wilson, during the World War. It was passed on to every soldier who fought in the war, carefully wrapped in the training received before going to the front. President Wilson told me it was a strong factor in raising the funds needed for the war. More than twenty years ago, Hon. Manuel L. Quezon (then Resident Commissioner of the Philippine Islands), was inspired by the secret to gain freedom for his people. He has gained freedom for the Philippines, and is the first President of the free state. A peculiar thing about this secret is that those who once acquire it and use it, find themselves literally swept on to success, with but little effort, and they never again submit to failure! If you doubt this, study the names of those who have used it, wherever they have been mentioned, check their records for yourself, and be convinced. The secret to which I refer cannot be had without a price, although the price is far less than its value. It cannot be had at any price by those who are not intentionally searching for it. It cannot be given away, it cannot be purchased for money, for the reason that it comes in two parts. One part is already in possession of those who are ready for it. The secret serves equally well, all who are ready for it. Education has nothing to do with it. Long before I was born, the secret had found its way into the possession of Thomas A. Edison, and he used it so intelligently that he became the world’s leading inventor, although he had but three months of schooling. The secret was passed on to a business associate of Mr. Edison. He used it so effectively that, although he was then making only $12,000 a year, he accumulated a great fortune, and retired from active business while still a young man. You will find his story at the beginning of the first chapter. It should convince you that riches are not beyond your reach, that you can still be what you wish to be, that money, fame, recognition and happiness can be had by all who are ready and determined to have these blessings.